Have questions but don't know who to ask? We are a locally owned and operated, full service title insurance company. Title insurance is used in real estate transactions to secure free and clear title for the buyer's benefit, and/or first lien position for the lender's interest. We are an agent for some of the largest title insurance underwriters in the nation, including Fidelity National Title Insurance Company and Stewart Title Guaranty Company. We are also a member of the Indiana Land Title Association. Ford Abstract Corp. was originally started by D. R. Ford, an attorney, and has progressed through the years with the same integrity and sincerity. Our office possesses a complete set of Decatur County real estate tract books, which date back to, and show, original purchases fromthe government of the United States of America! We keep the tract books current with up-to-date postings. These books make up a part of our title plant, which has been approved by the Indiana Land Title Association. Laura Litmer, as owner since 2006, has worked in the industry since 1987. Also on staff is Debbie Schneider with over 20 years experience. In working closely with lenders, brokers and real estate agents, we are able offer quality products and service. We can assist with everything from the first thought of selling, buying or re-financing your home, completely through to the final closing! 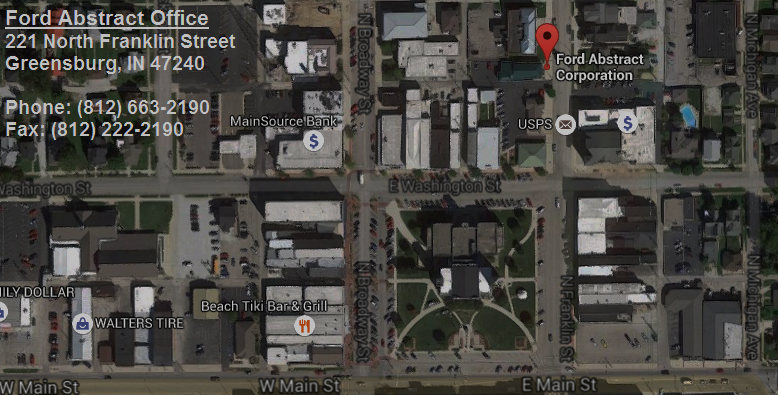 We are downtown just 1/2 a block north of the Decatur County courthouse on Franklin Street.